I'm not religious, I don't celebrate Easter but I do celebrate the fact that easter is a hell of a long weekend! And what better to do with those spare days from work and study than to go home and see old family and friends. I spent this weekend in Casterton, my home town, and brought the boyfriend home for the first time. He seemed to like it and I had the most wonderful time catching up with long lost friends. I also went to some markets and found some great things! I will be posting on those soon. 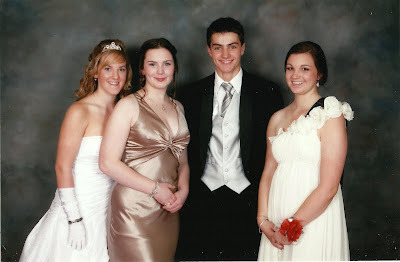 Here is an old photo of me and three good friends at our debutante. Such a lovely memory and it was so great to see them all. I hope everyone's Easter was as wonderful as mine! From left, Danielle, me, Ben and Bek.